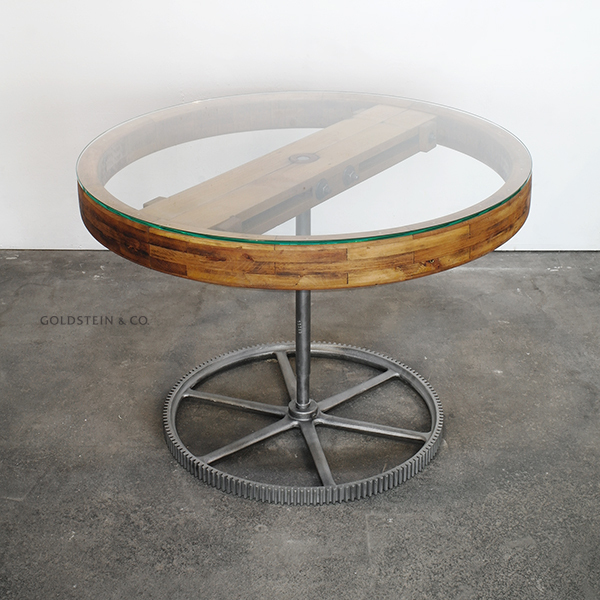 Round industrial dining table with metal base and glass top. 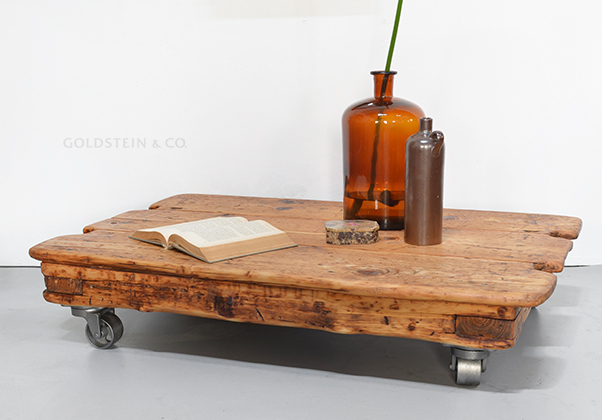 Industrial chic coffee table on small cast iron wheels. 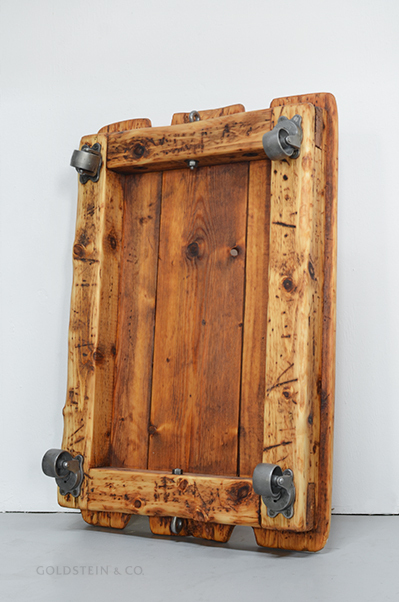 The wheels have been sandblasted, brushed and waxed, while the wooden planks have been sanded and oiled. 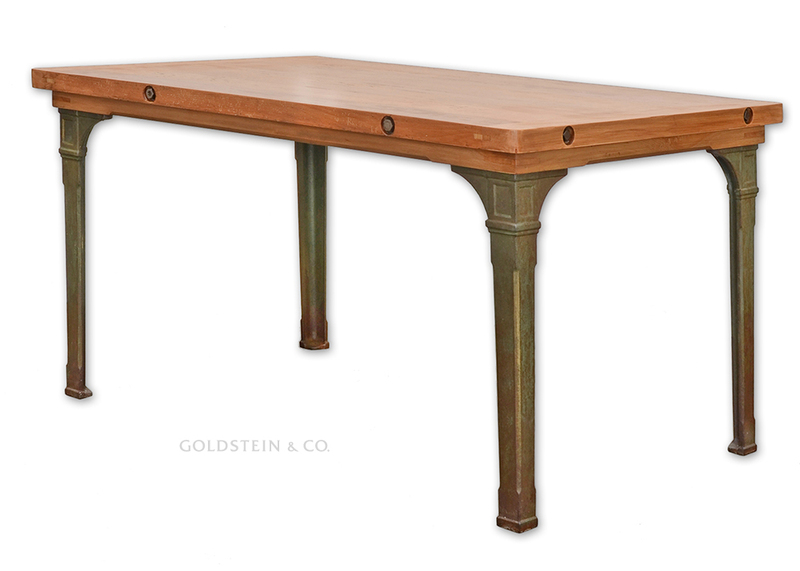 This type of table was built for the German railways around the turn of the 19th/20th centuries. 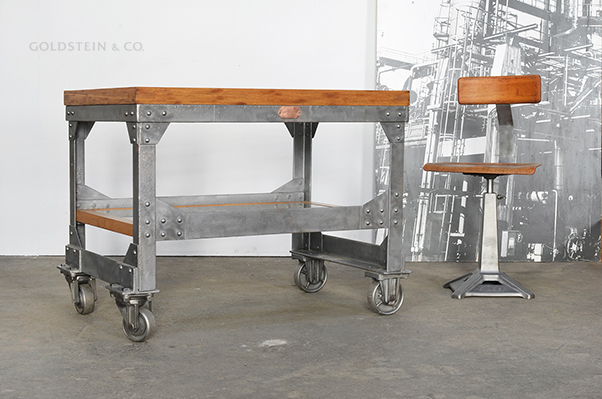 They were used as office desks and workbenches in railway workshops. 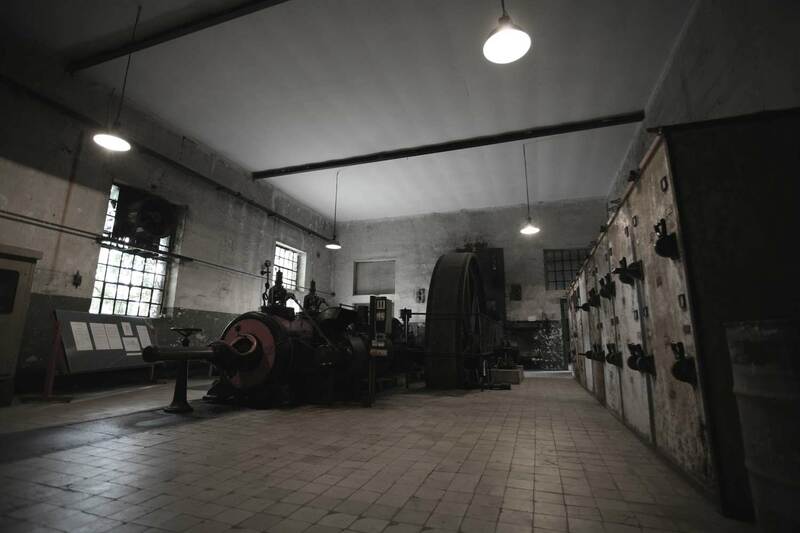 Moreover, they were sometimes fitted with switches and used as switchboards to control for example lighting systems. 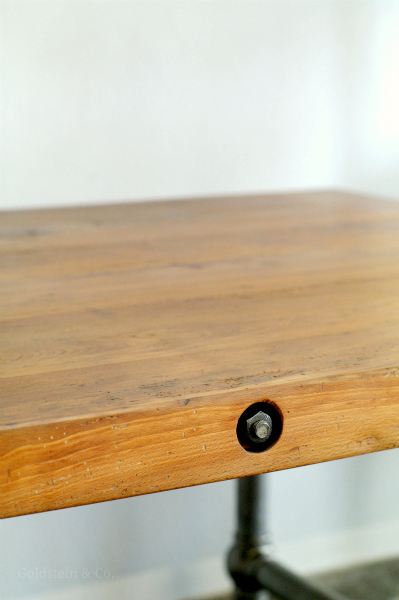 The tabletop has been sanded smooth and sealed with hard oil. 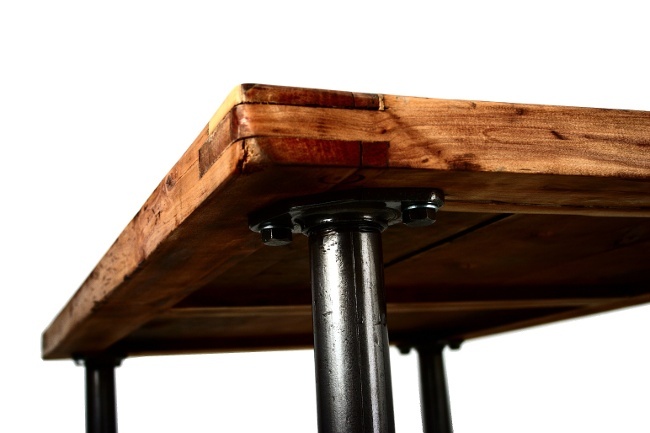 The legs of the table are made out of cast iron and finished with transparent varnish. 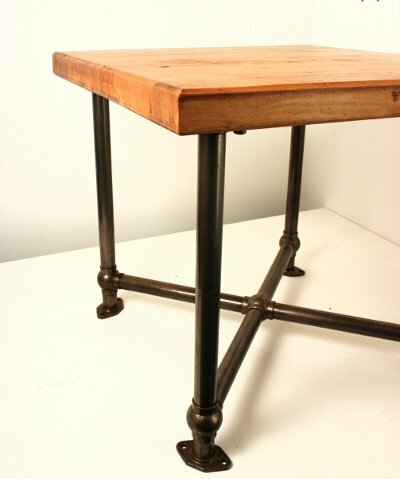 Note that this combination of a wooden tabletop and metal legs is highly unusual. 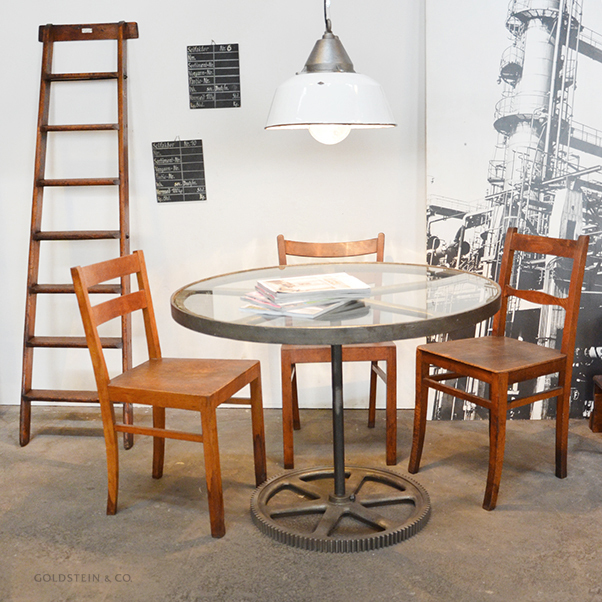 Similar tables in other sizes are available on request. Please contact us if you are interested. 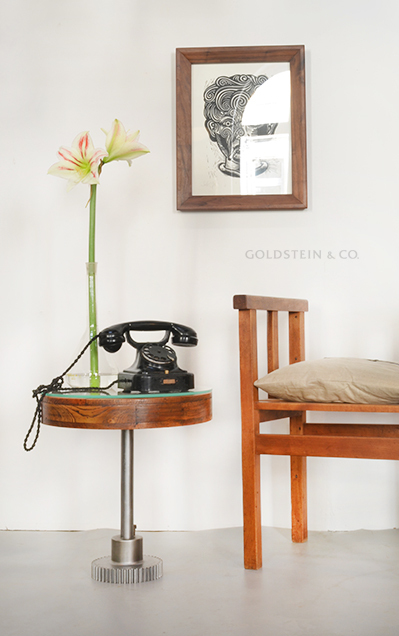 We have assembled this beautiful side table out of a number of fascinating industrial relics. 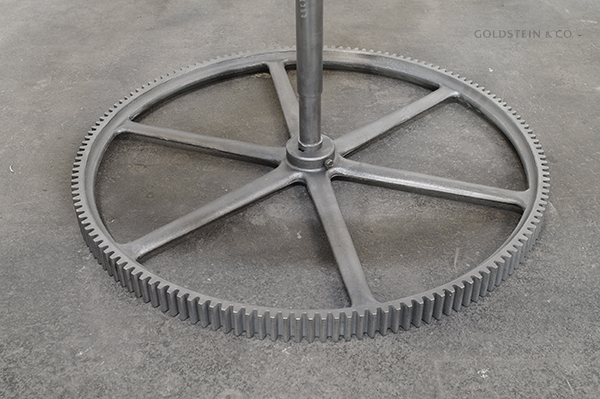 The base is made out of a cast-iron cog and an axle, both remnants of an antique machine. 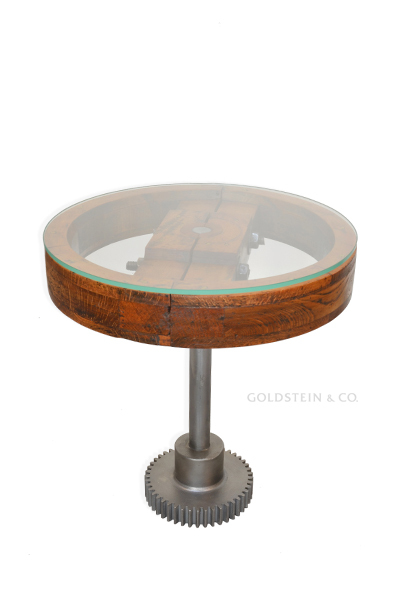 The glass tabletop rests on an antique flywheel. 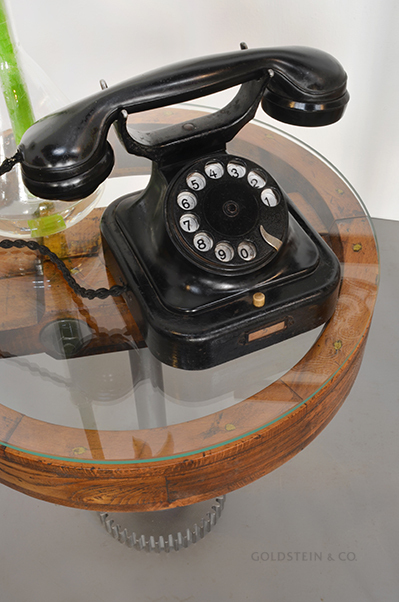 The glass top is 6mm (1/4" inch) thick and has been ground at the edge. 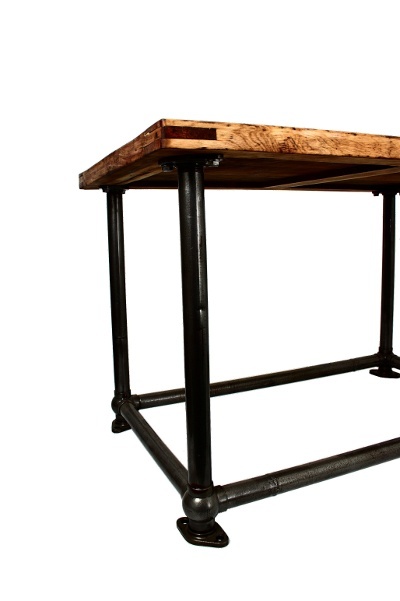 Please note that the height of the table can be customized. 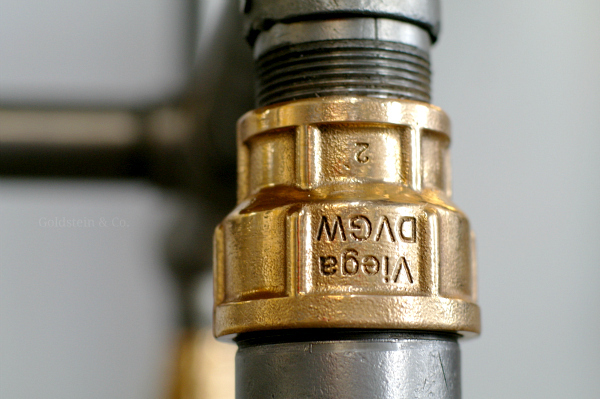 For further information or if you have any questions please do not hesitate to contact us. 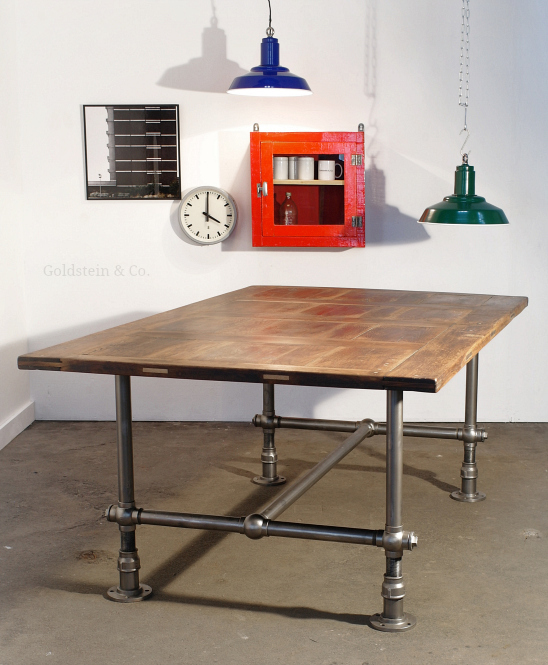 We have assembled this extraordinary table out of a number of fascinating industrial relics. 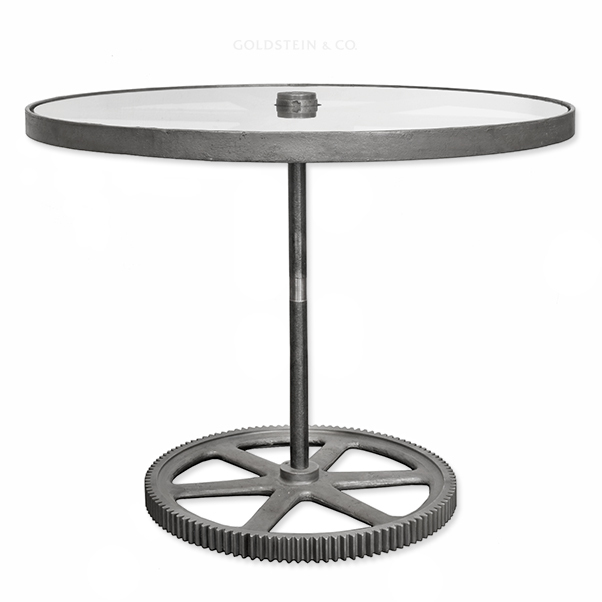 The base is made out of a cast-iron cog and an axle, both remnants of an antique machine. 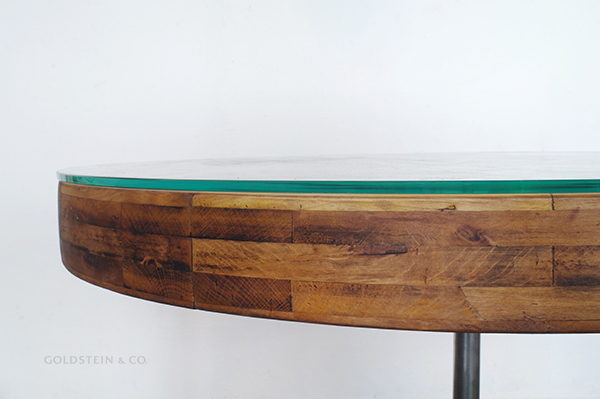 The glass tabletop is 1cm (3/8" inch) thick and has been ground at the edge. 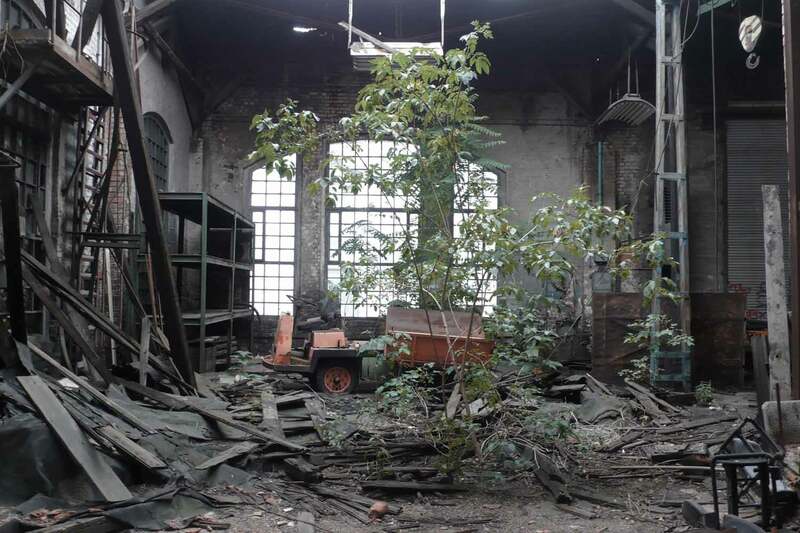 It rests on an antique flywheel from what was once the biggest industrial mill in Europe – Zipperer Mill near Leipzig. 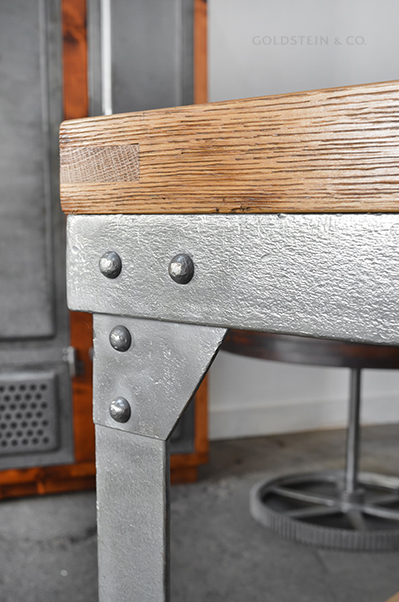 All the metal parts have been sandblasted, brushed and treated with hard wax oil, while the wooden parts have been sanded and oiled. 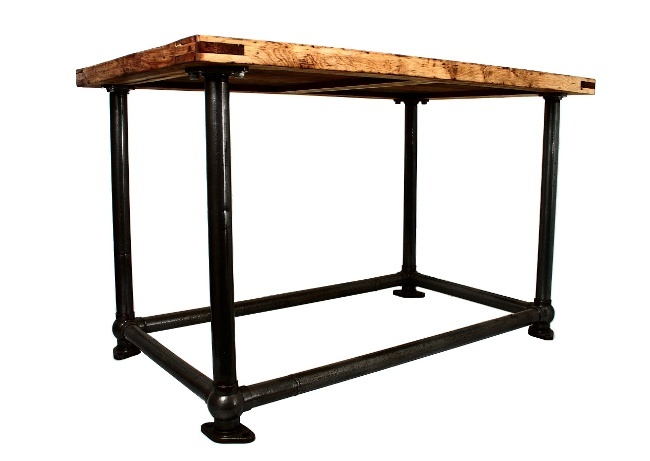 To make this dining table, we’ve combined a very old panelled oak top with an antique steel tube frame. 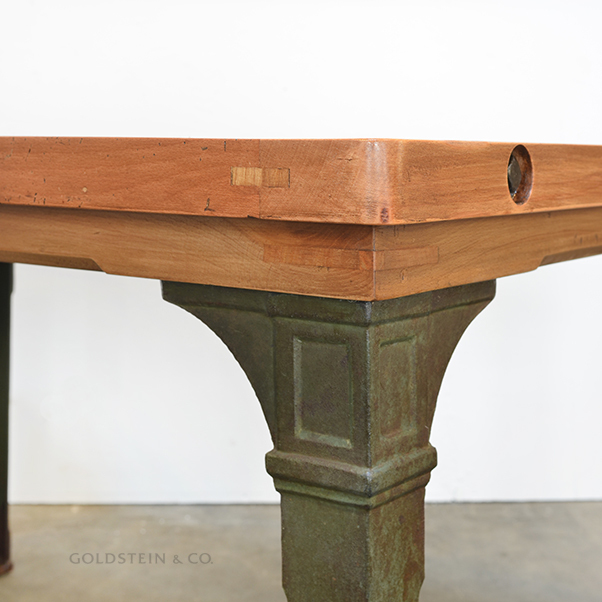 We recovered the tabletop from the Grassi Museum in Leipzig shortly before the museum was completely refurbished. 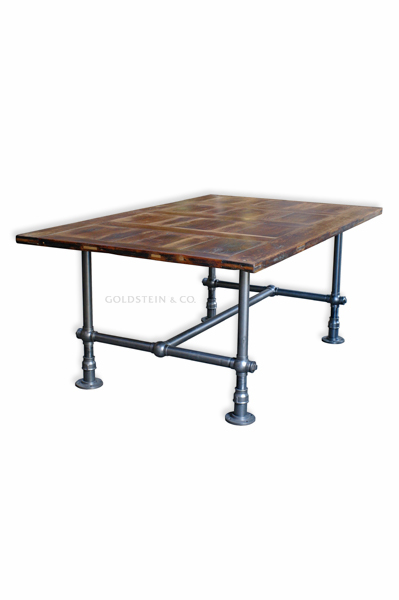 The frame is made out of old steel tubes which were originally used as railings in an industrial plant in the first quarter of the twentieth century. 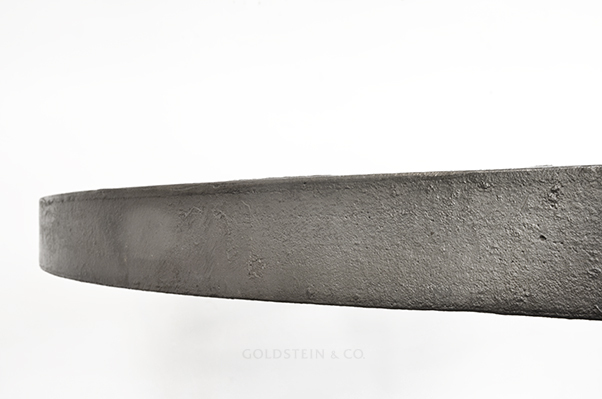 We’ve sandblasted, brushed and waxed the steel. 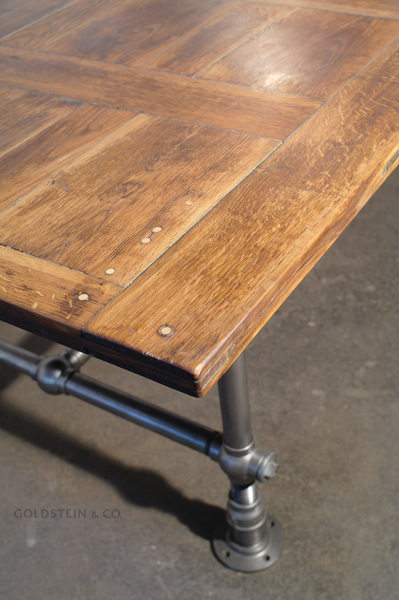 The oak tabletop shows traces of use and repair, which certainly makes it look authentic! 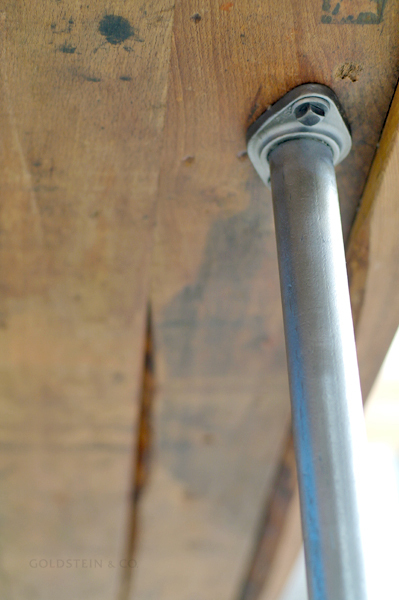 During restoration, we sanded and oiled it. 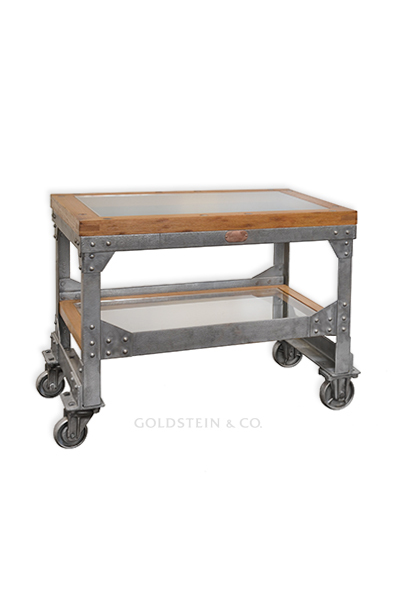 Please note that the table can be customized. 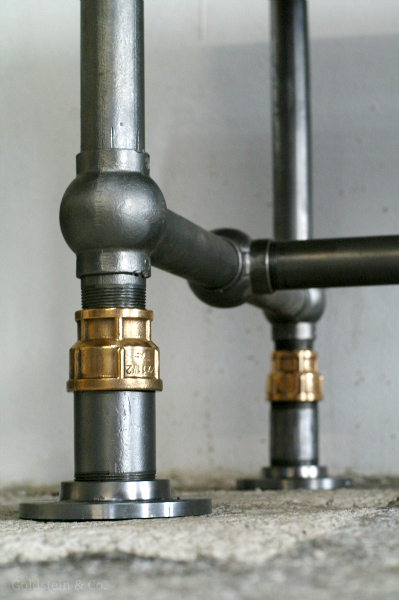 For further information or if you have any questions please do not hesitate to contact us. 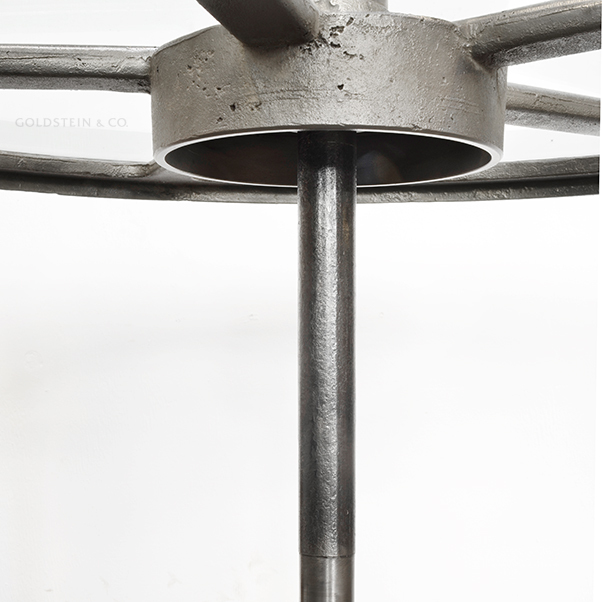 This sturdy table has been assembled using steel pipes, which are connected by cast-iron ball elements. 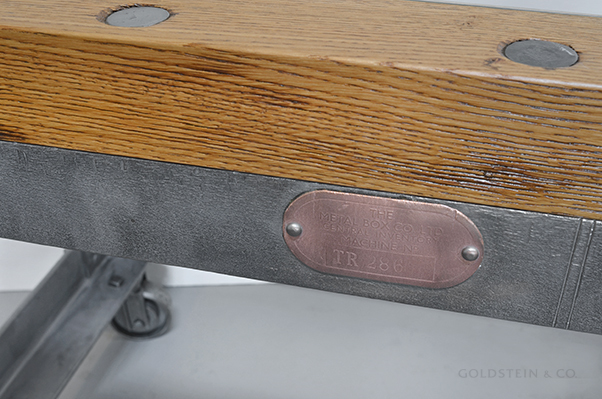 The antique hardwood tabletop was used around 1890 in a former cotton mill in Crimmitschau in the district of Zwickau. 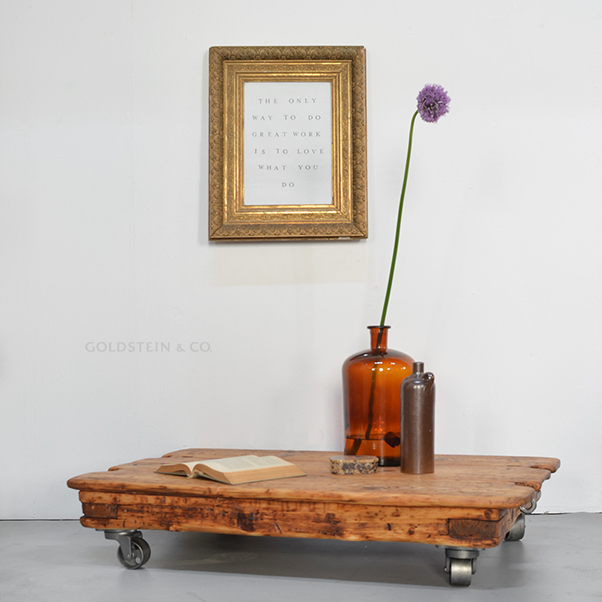 The plate has been sanded and oiled. 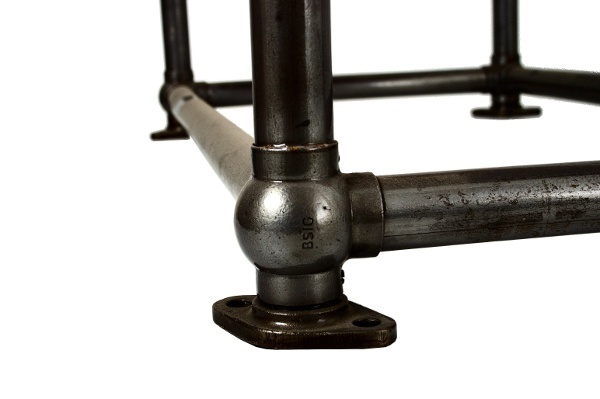 Height adjustable from 74cm (29,1'') to 86cm (33,9"). 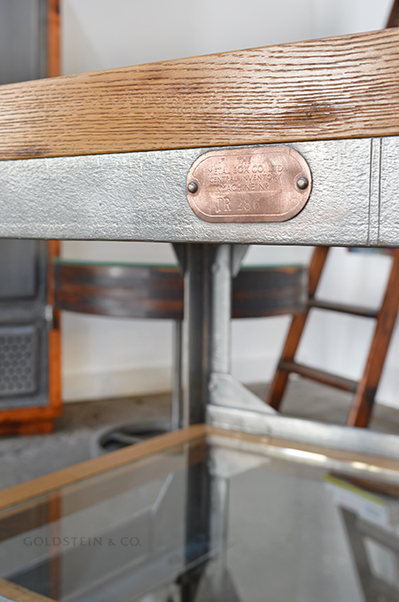 This sturdy table has been assembled using railing components made in the 1920s – a series of steel tubes held together with cast iron connecting elements made by the German firm Bergische Stahlindustrie (hence the BSIG marking) in Remscheid. 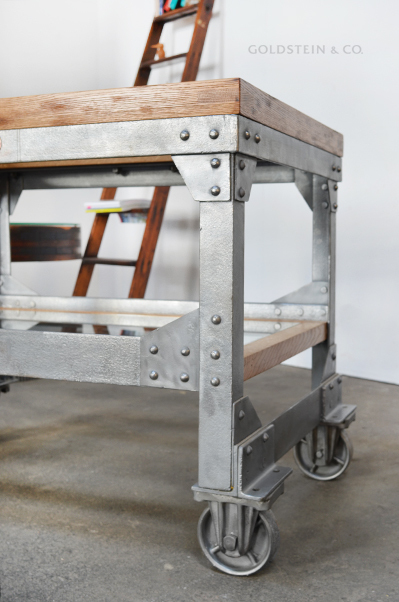 We turned them into a table substructure. 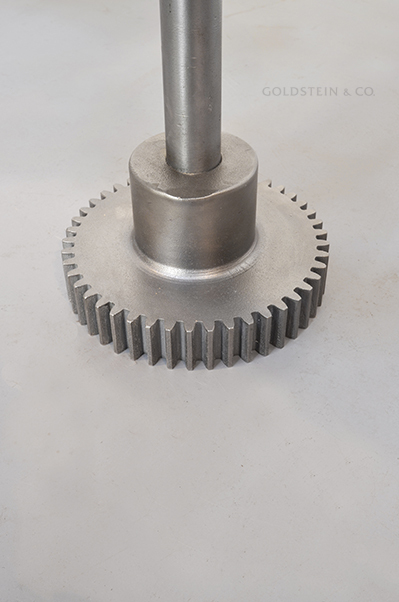 Since the connectors are available in a wide range of types, almost any geometrical arrangement is possible. 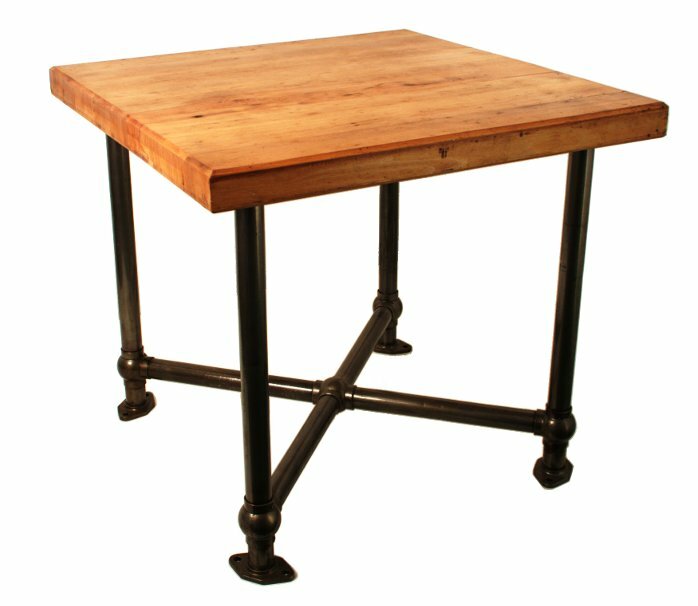 The tabletop is made of common beech and was taken from a workbench once used by the Deutsche Reichsbahn railway operator. 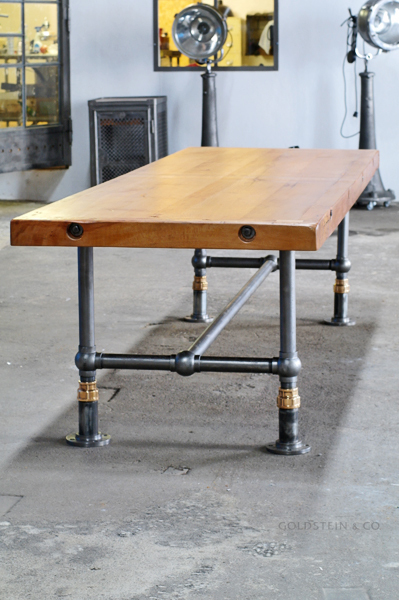 The photo should be regarded as merely a sample as large quantities of the railing components, tabletops and hardwood boards are available for alternative designs. 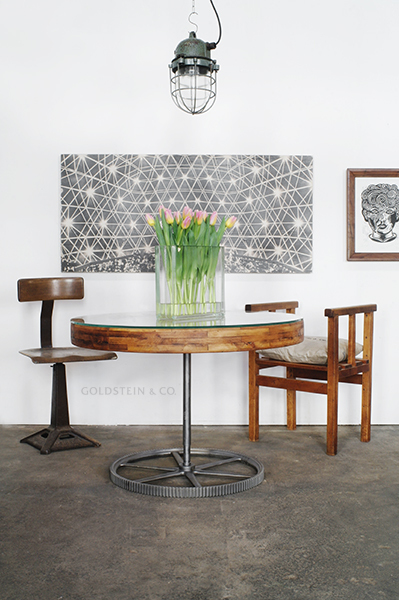 Availability:The table shown in the picture is sold. 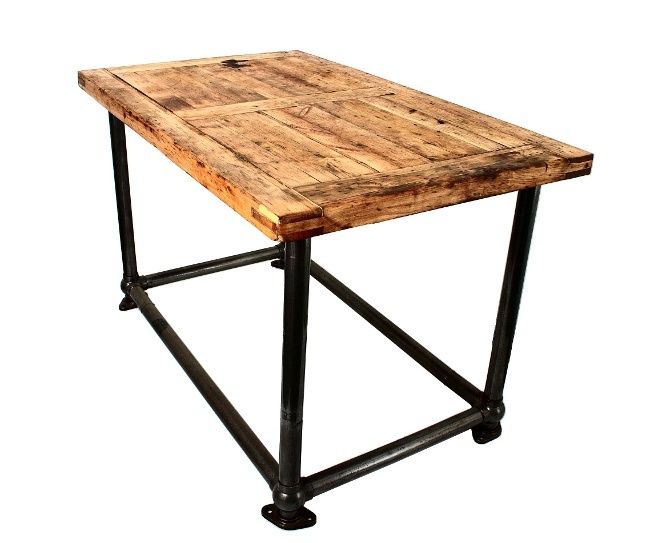 However, similar tables are available on request. Please contact us if you are interested. 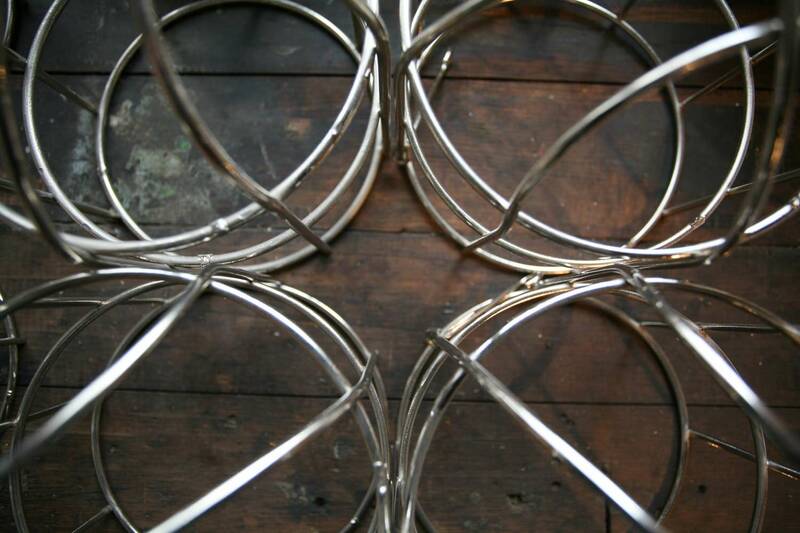 We have managed to salvage a large batch of railings produced in the 1920s. 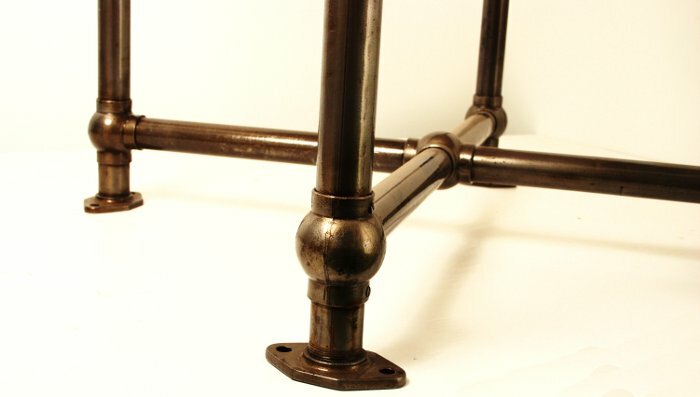 These railings consisted of steel tubes screwed together using cast iron connectors. 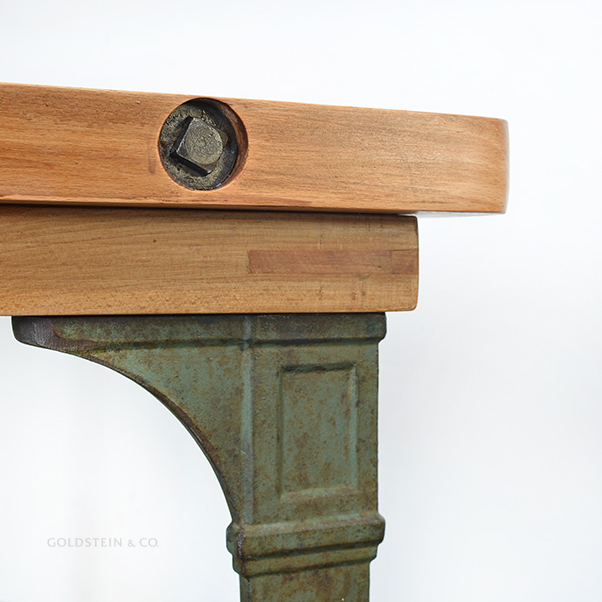 On seeing this design, we were inspired to apply it to furniture – and one of the first results is this table. 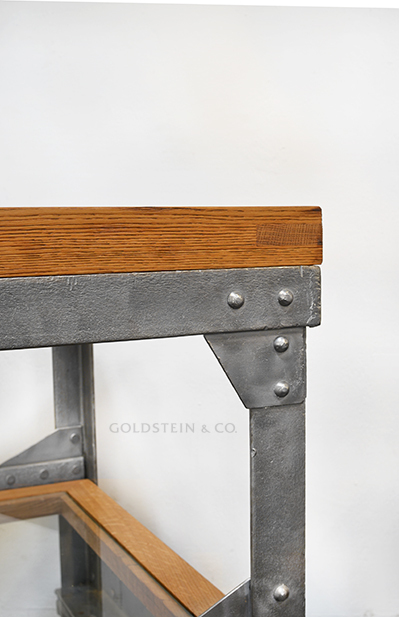 We stripped the paint from the cast iron and steel elements before brushing and powder-coating them. 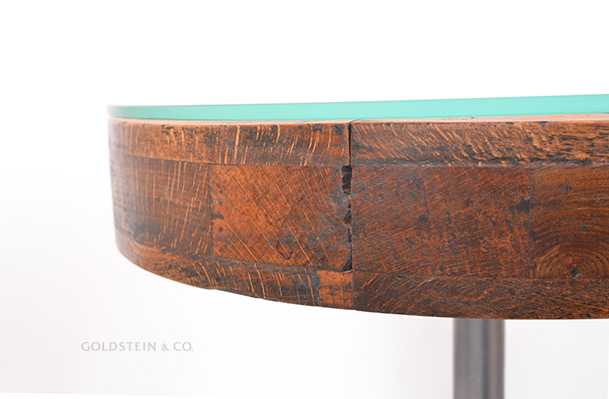 The beech tabletop is 7.5 cm (2.5") thick and was taken from a work bench dating back to the 1920s. 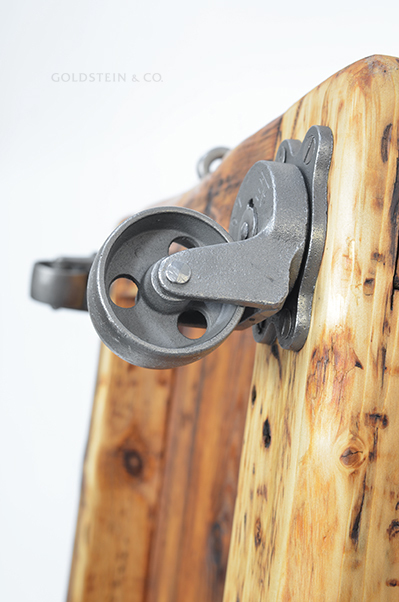 It has been treated with linseed oil.